Jesus chose Saul of Tarsus for a big task – take the Gospel of Christ to the Gentile world. Why did Jesus choose Saul? Why select a deeply devoted Pharisee from Tarsus to take Christianity to a world of pagans, idol worshippers and lovers of philosophy? Saul viewed the Lord’s calling as extremely personal: “But when it pleased God, who separated me from my mother’s womb and called me through His grace, to reveal His Son in me, that I might preach Him among the Gentiles” (Galatians 1:15-16). “Paul was knowledgeable about the philosophical and religious beliefs of the Athenians. One prominent Athenian school was Stoicism, founded by Zeno of Cyprus and developed by a later Zeno from Paul’s hometown–Tarsus, another of the three great centers of learning in the Roman Empire (the third being Alexandria in Egypt). Paul would have had plenty of opportunity to learn about Stoicism and competing worldviews. No wonder, then, when Paul was challenged to explain the new foreign gods that the Athenians thought he was proclaiming, he brought together his knowledge of Scripture and Jewish traditions and theology with the practices of Gentile idolaters and philosophers.” (p. 13). Have you ever wondered why Luke included only portions of a small number of Paul’s speeches in Acts? The Apostle traveled across much of the Greek and Roman world for many years preaching the Gospel. The number of his speeches probably numbered in the hundreds (maybe thousands), but Luke shared only about a dozen. And of those dozen or so speeches by the prolific Apostle, Paul could have spoken them in less than a couple of minutes (as recorded in Acts). Another important point the authors make about Paul’s speeches is that each one addresses a different audience in different situations. That demonstrates Paul’s desire to reach each person and group of people in ways that were meaningful to them. That’s an important lesson for Christians today who want to reach the world with the Gospel. Paul’s audience in Athens included at least three primary groups: Jews, religious people who worshiped many gods and goddesses, and philosophers. Even as Paul was able to dialogue well with members of each group, so should Christians today be equipped to share the Gospel with anyone they meet. That brings us to why and how we do what we do when we share the Gospel of Christ with non-believers. The authors did a great job comparing various methods of persuasion used today as compared with the early Christians. Their section analyzing Paul’s rhetorical method is quite revealing and helpful as we consider how best to approach the people God has placed in our path. Paul did not address the Areopagus in Athens because he had some time to kill on his way to Corinth. He viewed the worldview of the religious people and philosophers of Athens as a spiritual illness that needed to be cured – and the cure was found in the Gospel of Christ. Paul challenged the core of their belief system and held them up as false and without hope. The real hope, Paul preached, was in the resurrection of Jesus Christ. How did his audience respond? Some mocked, some said they would hear Paul again on the matter, and some joined him and believed. Sounds like the making of a great sermon in any church in the country and a great way to help some non-believing friends learn about the God who loves them. This hits home for me and should for any Christian apologist. We are “faith defenders,” so we spend a lot of time in the “on guard” spiritual position. To use a self defense example for a moment, imagine being always in a physical on-guard position. You would always be ready to defend yourself and others, but you would eventually wear yourself out and you would not appear approachable. I think the same is true with “faith defense.” If we are always in a spiritual on-guard position (e.g. ready to pounce on every unbeliever about their unbelief), we will wear ourselves out, and more importantly, we won’t appear approachable to unbelievers. The most experienced martial artists have learned how to conceal their self-defense skills until needed. That allows them to conserve energy for self defense and appear approachable. The Apostle Paul was always ready to defend the faith against any attack, but he tempered his skill with love and respect for those God had called him to serve with the truth of the Gospel of Christ. Drs. Copan and Litwak did a wonderful job in the final chapter of bringing Paul’s message on Mars Hill to bear on our ministries today. One of the most important aspects of their summary chapter to me dealt with evangelism and apologetics being a process rather than an event. 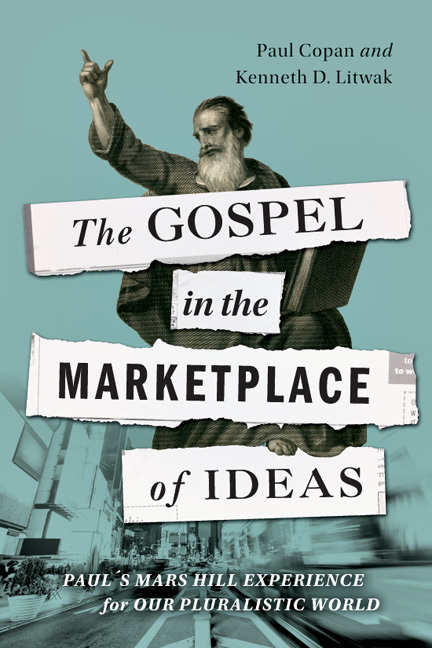 I highly recommend The Gospel in the Marketplace of Ideas for your personal reading and as a group study. The authors included Discussion Questions at the end of the book to help facilitate group studies. This is one of the best practical books on real-life apologetics I’ve had the privilege of reading and am looking forward to participating in a group study with this book as the guide. You’ll also find the Resources for Further Reading and Bibliography a great help in selecting more great reading on the Christian worldview, evangelism and apologetics.